How to Enable Social Sharing on Posts, Jobs, Resumes Etc. 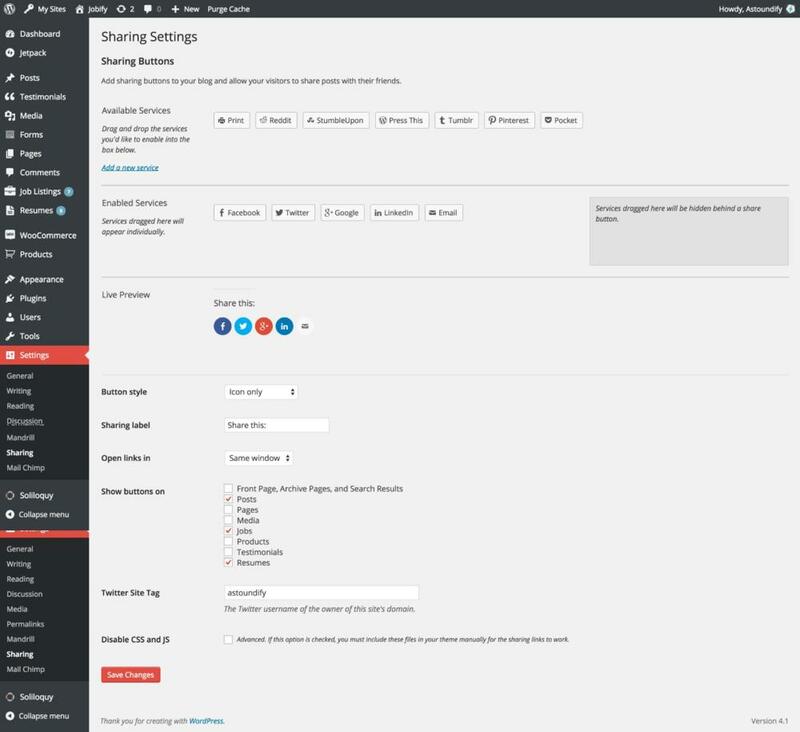 If you would like to display social sharing options on posts, jobs, resumes, you will need to install the JetPack plugin, and if you haven't already created a WordPress.com account you will need to create one. Install the JetPack plugin by visiting Plugins > Add New > Search Plugins "JetPack" and click Install Now. Once installed activate the plugin and connect to your WordPress.com account. Once you have installed JetPack and activated the plugin JetPack > Settings > click Activate "Sharing" Once activated click on Configure. Now its time to setup the sharing options, you can drag what social options you wish to use on your website to the "Enabled Service" area, see the screen shot below on how we have set it up on our demo. Once you have chosen your social options visit "Appearance > Widgets" and add the Share widget.